Our pets are our best friends, and we show them how much we love them by making sure they’re healthy and happy. One major way to do this is to take them for regular visits to their veterinarian. Today’s holiday celebrates all of those doctors dedicated to ensuring that the furry friends in our lives have the best care possible. If you have a pet, why not send your veterinarian a quick Thank You email to tell them how much you appreciate all they do. It’s time for Biscuit to have a checkup. The little girl gets out Biscuit’s leash, and Biscuit happily goes along to the veterinarian’s office. There a bunny, a gerbil, and a parrot are also waiting to see Doctor Green, who “cares for many different animals” and “makes sure they are all healthy and strong.” Soon it is Biscuit’s turn to see the doctor. Image copyright Pat Schories, 2008, text copyright Alyssa Satin Capucilli, 2008. Courtesy of HarperCollins. For being such a great patient, Dr. Green has a special treat for Biscuit. “‘Woof, woof!’” says Biscuit before gobbling down the bone-shaped cookie. Then Biscuit has a “special treat for Dr. Green. It’s a big kiss!” Biscuit’s checkup is over and it’s time to go home, but Biscuit has gone exploring. What is behind the curtain in the next examining room? Alyssa Satin Capucilli’s beloved Biscuit series helps young readers understand exactly what will happen when they take their pets to the veterinarian. Capucilli’s straightforward storytelling, lively dialogue, and plenty of tail-wagging “woofs” from Biscuit reflect the sweet, caring relationship that little ones have with their pets. Pat Schorie’s bright illustrations give readers a close-up view of what a visit to a veterinarian entails. Children will see that a trip to the doctor for their dog, cat, or other furry friend is much like their own checkups, which offers a source of familiarity and comfort for children who may have questions. Biscuit is playfully adorable, and young readers will be intrigued to see what is behind the curtain. Biscuit Visits the Doctor is a great book to pick up before any pet’s check-up to share the experience with children. Discover more about Alyssa Satin Capucilli and all of her books on her website. Learn more about Pat Schories and view a gallery of illustration work on her website. Veterinarians love helping your pet, and your pet loves the care and attention vets show them! 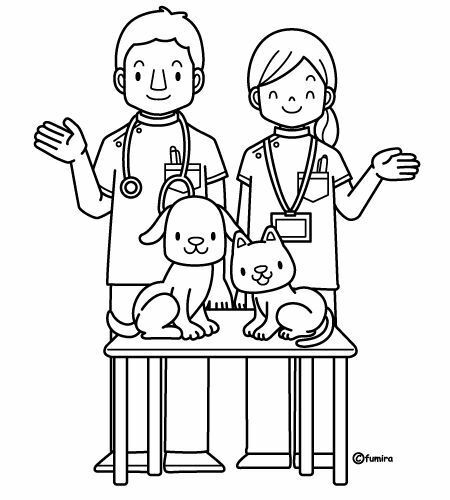 Grab your colored pencils or crayons and enjoy this printable Your Pet Loves the Vet! Coloring Page.